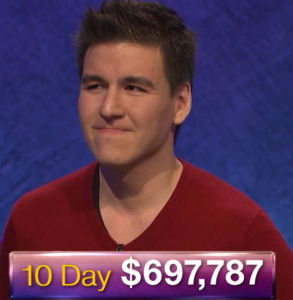 Andy Saunders of thejeopardyfan.com is tracking James Holzhauer’s Jeopardy! statistics and comparing them to those of Ken Jennings. Today’s Final Jeopardy answer (in the category Stamps) and statistics for the Monday, April 15, 2019 game between Megan McLeod, Kevin Bohannon, and 7-day champion James Holzhauer.